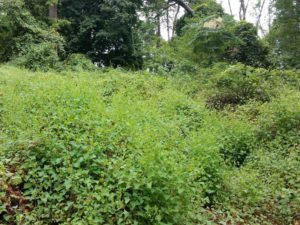 More than 33 invasive plant species have been detected in the Hilltop Reservation, at least half of them in large, dense infestations – due in part to the Hilltop’s history of human use and disturbance, which disrupted native plant communities and created opportunity for invasion. In addition, wherever canopy gaps have occurred (e.g., from tree disease or blow-down), invasive plants have become abundant. 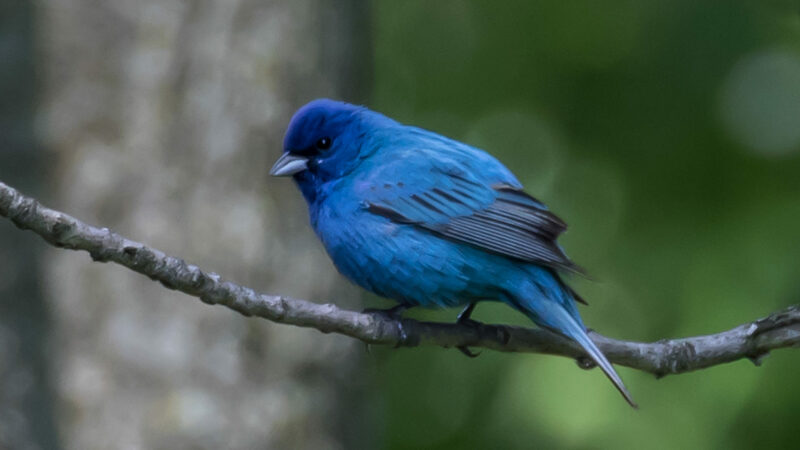 Invasive species are one of the top threats to New Jersey’s natural areas, second only to habitat loss / destruction (per the NJ DEP, NJ FWS, Rutgers NJAES, NJ Audubon, The Nature Conservancy). Invasive species are formally defined as “a species that is 1) non-native (or alien) to the ecosystem under consideration and 2) whose introduction causes or is likely to cause economic or environmental harm or harm to human health” (National Invasive Species Council 2001). Invasive species pose numerous economic and public health issues, but it is their environmental threat that is our focus on the Hilltop (see our Ecological Assessment). These aggressive foreigners grow quickly and over a long season, have few to no natural predators, and can even change the soil chemistry to prevent other plants from growing. Once they take hold they crowd out native species, resulting in monocultures. And as our native wildlife often do not recognize invasive plants as food, these infested areas end up providing far less benefit than native plant communities. 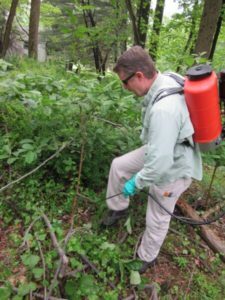 To address this stewardship issue, in 2016 the Hilltop Conservancy teamed up with Essex County and the New Jersey Invasive Species Strike Team to develop a detailed Invasive Plant Management Plan for the Reservation. 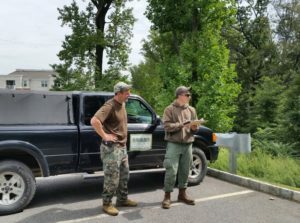 The Strike Team’s “Early Detection & Rapid Response” approach is the most cost-effective and efficient invasive plant control strategy to prevent further degradation of the Hilltop’s ecological health. The plan lays out species priorities, maps their locations, and realistically estimates the resources required to achieve our control objectives over the next 10 years. See plan documents below, as well as progress to date and next steps.